Fourteen years ago today, our favorite neighbor, an amazing, extraordinary person, Fred McFeely Rogers passed away. A beautiful man of many talents, he wrapped his wisdom in the simplest phrases preschoolers everywhere could understand & embrace … Preschoolers– like me. 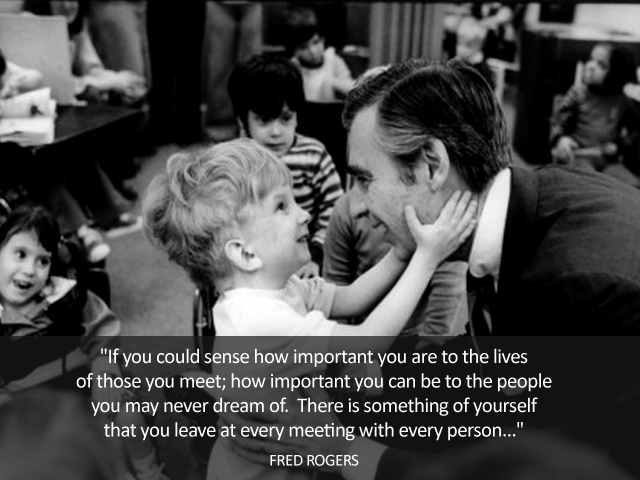 We miss you Mister Rogers. It’s you. I. Like. I have a book of his wisdoms. Such a force for loving good. …a force for loving good … so true. He was a wonderful soul. Oh, how I loved Mr. Rogers. So calming and wise. Thank you 🙂 Yes, he was. Great to be reminded of this sweet and wonderful man. A great tribute Wendy. Our children grew up with him and it was always such a treat to watch with them. Thanks for posting this. Warmest wishes as always. Bedankt voor alle bezoeken aan mijn blog.Fijn weekend. I still know the words to his into and exit songs. that’s so true,what Mr. Rodgers said. In 1987, an actress and singer (born 1927) decided to move from Cologne, here in Germany, to the Fiji islands for health reasons. She finished her career and said Good-bye with a final song, which is still popular for some reason. “Niemals geht man so ganz” (never you leave so completely). The next line gives the reason “irgendwas von mir bleibt hier, es hat seinen Platz immer bei dir.” (something of me stays here and has a place with you for ever). Although, you can find the lyrics online, you’d have an extremely hard job translating them to english, ’cause several parts are in the local dialect of Cologne. How beautifully written. I have no idea who this person was – but he must have been just like you describe him. Happy Easter! Happy Easter Leya 🙂 He had a TV Show for Preschool age children for decades! He was such a wonderful man and teacher!